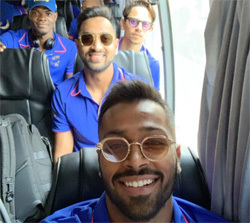 MUMBAI: While Mumbai Indian cricketer Hardik Pandya deposed before the BCCI ombudsman on Tuesday in connection with the chat show case, India opener KL Rahul is expected to depose on Wednesday morning. The ombudsman will submit his report before the national selectors begin the process of selection of the Indian team for the 2019 World Cup. The controversial Koffee with Karan episode featuring the two cricketers was telecast early January. The Committee of Administrators (CoA) called the duo back from the tour of Australia and provisionally suspended them. Both tendered apologies and their ban was provisionally lifted pending inquiry. Rahul wrote in his apology: "At the outset, I extend my unconditional heartfelt apology for this extremely unfortunate incident. I'm extremely ashamed and embarrassed since this has caused such disgrace and embarrassment to both, the BCCI and sport of cricket. I assure you that, I shall, in the future, act more responsibly and shall ensure that my actions befit my stature as cricketer and a public personality representing India and the BCCI, across the globe." Pandya faced widespread attack when in an episode of a talk show he, along with Rahul, made misogynistic comments about women, and were suspended by the Board of Control for Cricket in India for poor conduct and tarnishing the image of Indian cricket. The ban has now been lifted. He returned to the side for the ODI series against New Zealand and performed admirably. He has a vital spot in India's 2019 World Cup plans. Earlier, Pandya had suffered a back injury during the Asia Cup in 2018 which ruled him out of the tour of Australia.